the number of pages is very less. My kid finished in just a day. Is there a jumbo book available? I had to just order online all my kids books. The portal has lot of colouring books. I have ordered many times through this portal. it is just 30/- and I should want to order more books like this. Is there any other cartoon character available or only hanuman? the quality of the book is very good. I like the colours which have been used. My kids love to colour this book. the pictures are good and the colours used are very nice. The shades are given and the kid learns names of the colours. the book is good. 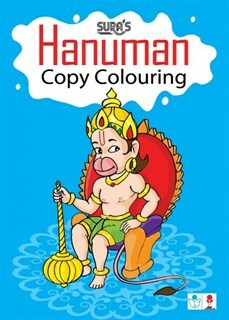 My kid loves the hanuman colouring book. She loves the cartoon. does the publication has more such books? Any other character? My kid wants chota bheem.